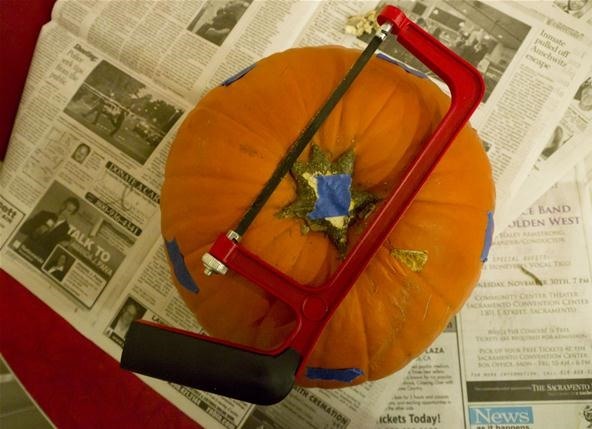 Halloween is coming up, so many of you may have a need or desire to carve a pumpkin and turn it into a Jack O' Lantern. 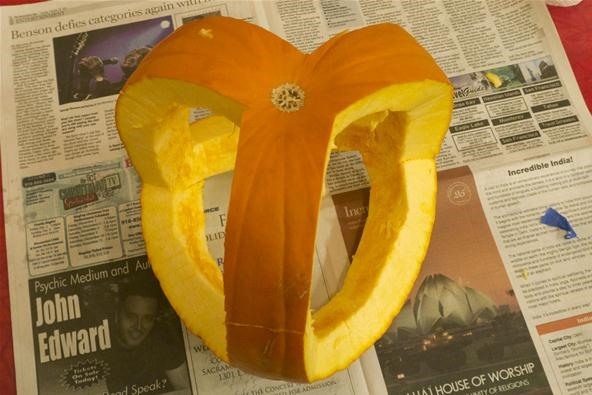 This week we are going to explore carving our pumpkins into interesting geometric shapes. 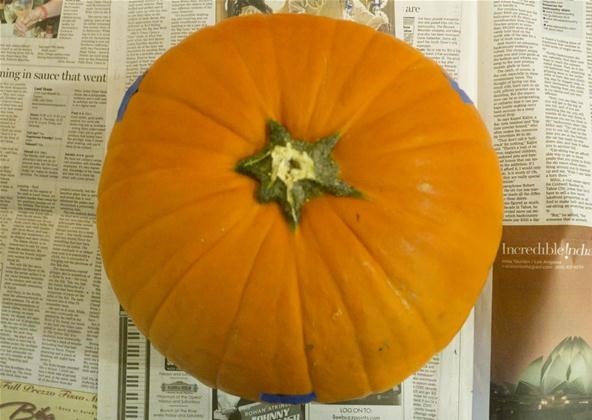 In this post, we will carve the pumpkins into spherical versions of polyhedra, and in Thursday's post we will carve 2 dimensional stars and some simple fractal designs into the pumpkins. When making any of these shapes, it helps to look at models of them. You can use either virtual models or other models such as these, which you can make from paper. 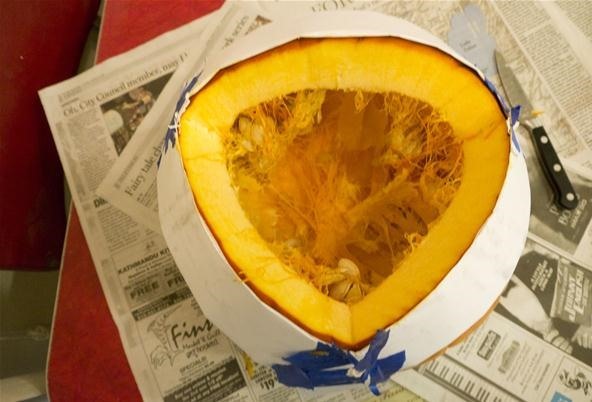 Also, you should look carefully at Vi Hart's post on carving polyhedra out of fruit because her pictures are better than mine. The tetrahedron is the simplest of the platonic solids having only 4 triangular sides, 4 vertices, and six edges. This means that it is the least work to cut out. However, it is not necessarily the easiest to make, as it can be difficult to find the vertices in a symmetrical fashion. 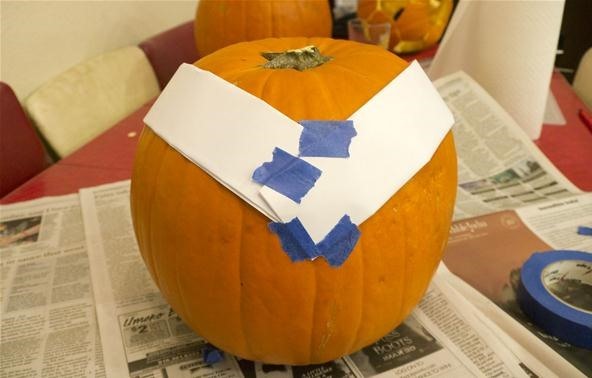 First, place the first vertex at the bottom of the pumpkin. 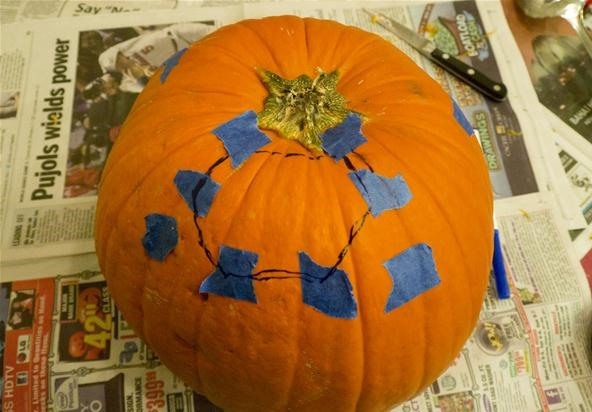 On the other end of the pumpkin you are going to place 4 vertices in an equilateral triangle. The goal is to have all of the edges formed equal the same length. This includes all of the side lengths of this triangle, as well as all of the lengths created when connecting up the points of the triangle to the vertex placed on the bottom. Now connect up the edges. I did this with folded paper strips cut to the correct length, but you could also do it with a pencil or other marking device. 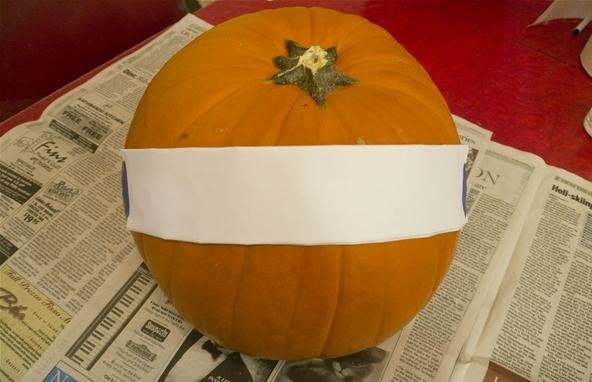 Notice how the paper curves around the pumpkin. This is the shortest distance between these two points, and the paper is under no stress as it curves along that path. Connect up vertices until you have formed a spherical triangle. Notice how different geometry on the surface of a sphere is. The lines no longer look straight from our perspective, and if you were to add up the interior angles formed by the triangle, they would be significantly greater than 180 degrees. Looking at it from the side, we see the next placement we need to make. Connect this vertex to the vertex on the bottom. Repeat twice more. Cutting the first spherical triangle out. The cube has 6 square faces, 8 vertices, and 12 edges. 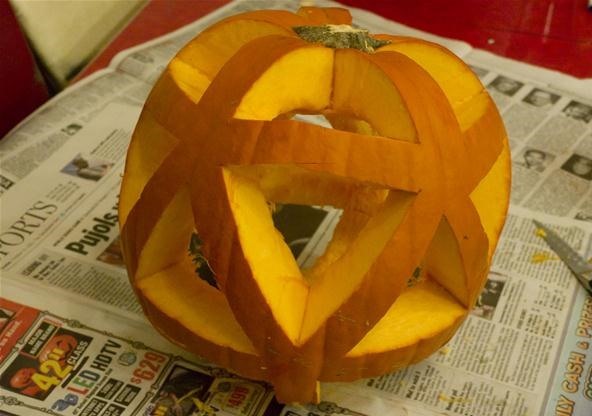 It is probably the second easiest of the platonic solids to carve. 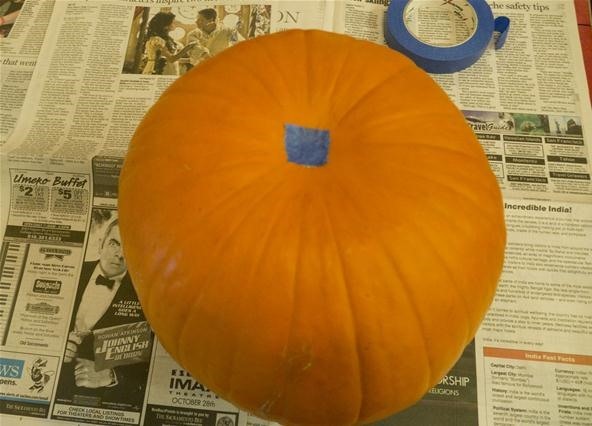 Place 4 vertices symmetrically around the top of the pumpkin. 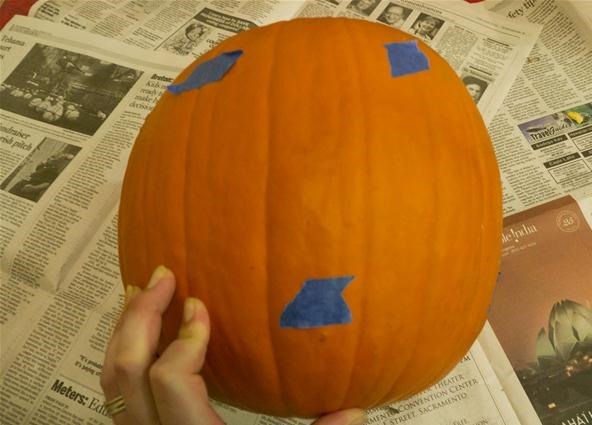 Place 4 more vertices around the bottom of the pumpkin, so you get squares formed on the sides. You might need to move the pieces of tape placed in this step and the previous step up or down in order to form symmetrical squares. Connect up the edges as shown with the tetrahedron and cut out the 6 faces of the cube. 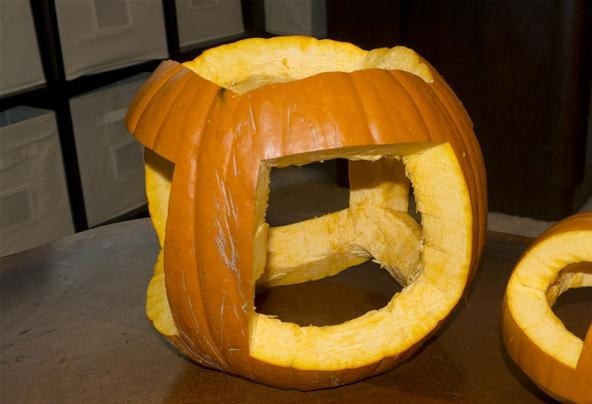 The octahedron has 8 triangular faces, 6 vertices, and 12 edges and is probably the easiest of the polyhedra to make out of pumpkins. The Dodecahedron has 12 pentagonal faces, 20 vertices, and 30 edges. 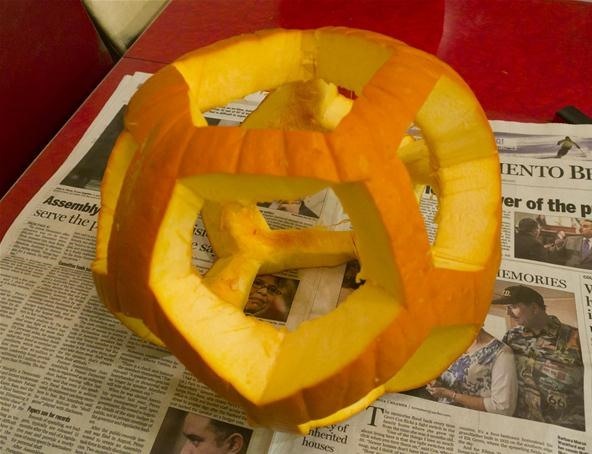 It is probably the hardest of the platonic solids to carve. I followed a different method from Vi Hart for placing the vertices on this one. Vi marks the vertices of the icosahedron and uses those to draw the faces of the dodecahedron. You might find her version easier than mine. 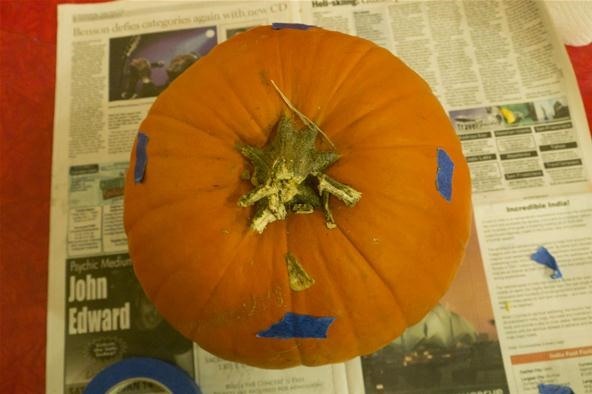 I found the vertices directly by first placing 5 vertices symmetrically around the top of the pumpkin. Then I placed 5 points below those first five points. 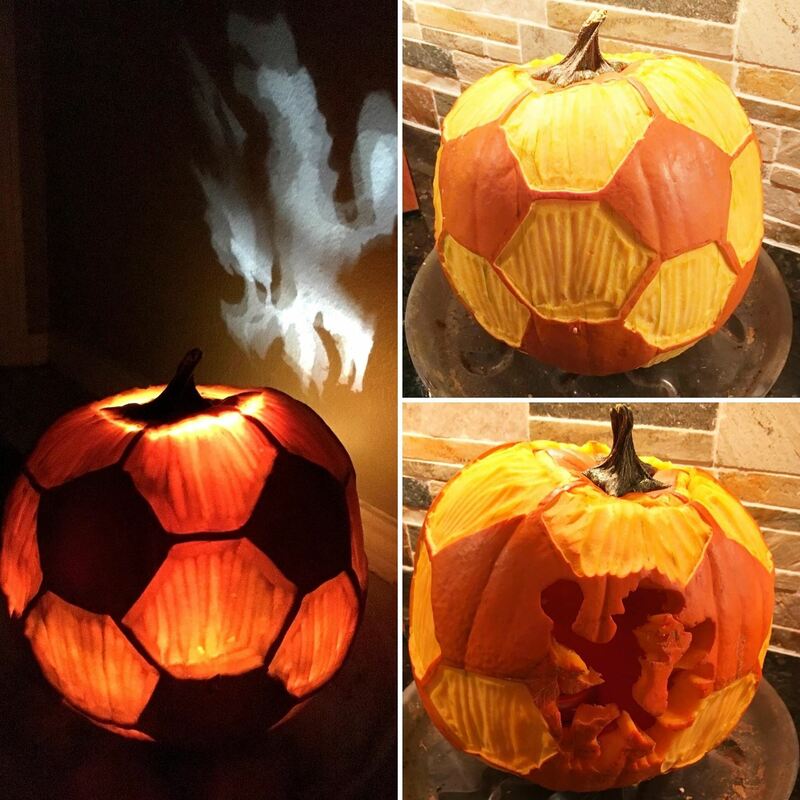 They should be just above the middle of the pumpkin. Then I placed 5 more points half way between those points, and just slightly below the middle. You should end up with a zigzag pattern. 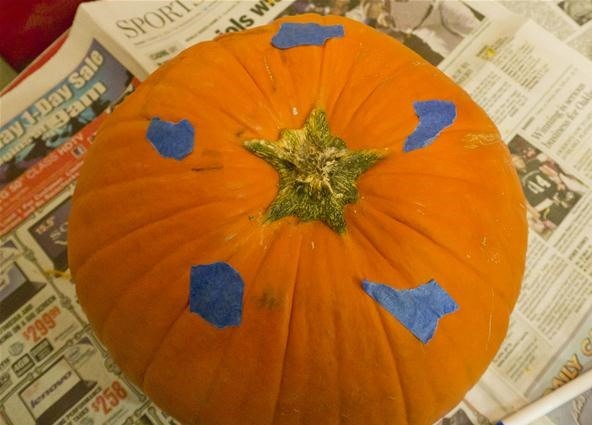 Finally, to place the final five points, I placed them directly below these points to form 5 points in a pentagonal pattern around the bottom of the pumpkin. The goal is to have all of the 12 pentagons formed have all angles by congruent. You might need to move the tape around a bit to do this. Connect up the vertices and cut out the pentagonal faces. The icosahedron has twenty triangular faces, 12 vertices, and 30 edges. 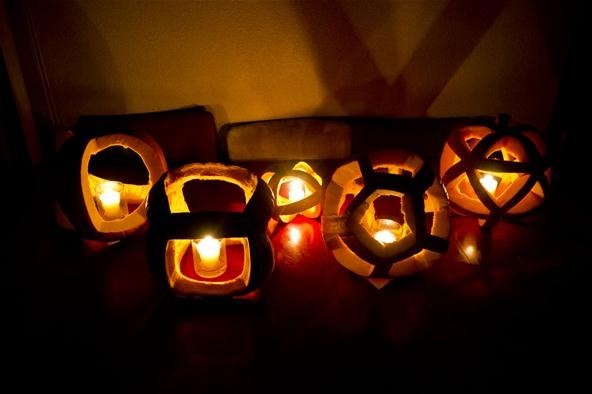 It is probably the second hardest and most time consuming of the platonic solids to carve. First, place a vertex on the top and the bottom. You might want to trim off most of the stem using a saw. 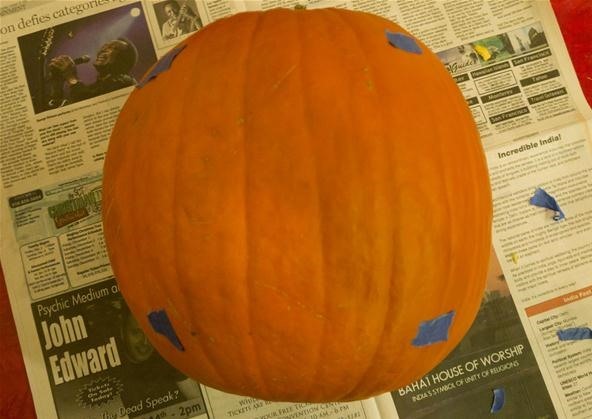 Next, place 5 vertices symmetrically around the top on the top portion of the pumpkin. 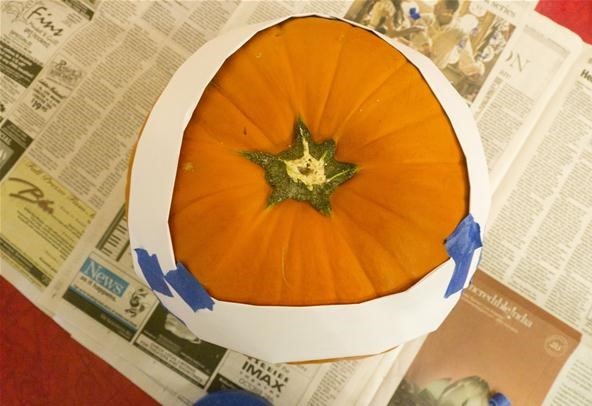 Now, place 5 more vertices symmetrically around the bottom portion of the pumpkin. They should be in the middle of the 5 vertices you just placed. Connect up the triangular faces between the vertices and cut them out. The truncated icosahedron is an archimedian solid with 12 pentagonal faces, 20 hexagonal faces, 60 verices, and 90 edges. 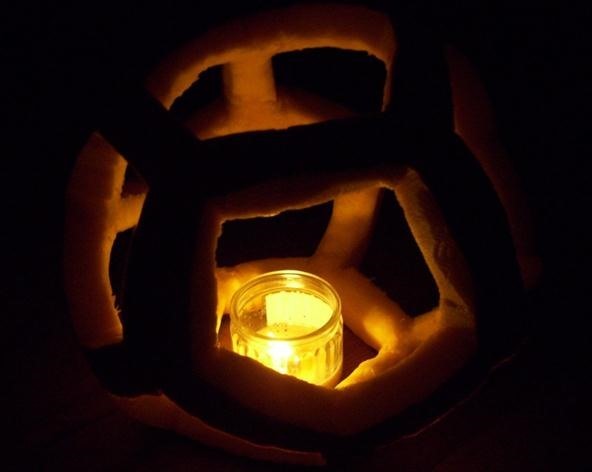 I did not cut out all of the faces as I did with the platonic solid pumpkins. 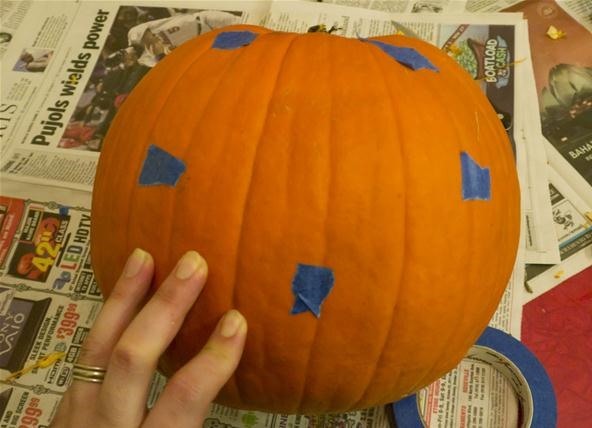 Instead I just cut out the 12 pentagonal faces and notched the additional hexagonal edges so that some light could make it through the pumpkin. A truncated icosahedron is formed by taking an icosahedron and cutting off all of the triangular faces so that only the middle third of the length of each triangle side remains. This forms 20 hexagons out of the triangles, and 12 pentagons where the tips of all of the triangles met before. In order to find the vertices of the truncated icosahedron, I first found the vertices of the icosahedron. Then, I took the sides and divided them into thirds placing the vertices on the endpoints of those thirds. If you connect up those new vertices and ignore the old ones, you will generate the hexagons and pentagons as shown below. Here's all of the pentagons and hexagons. If you build one or all of these, let us know by posting a picture or video up on the corkboard. If you have any ideas of how to make these better or faster, be sure to comment. 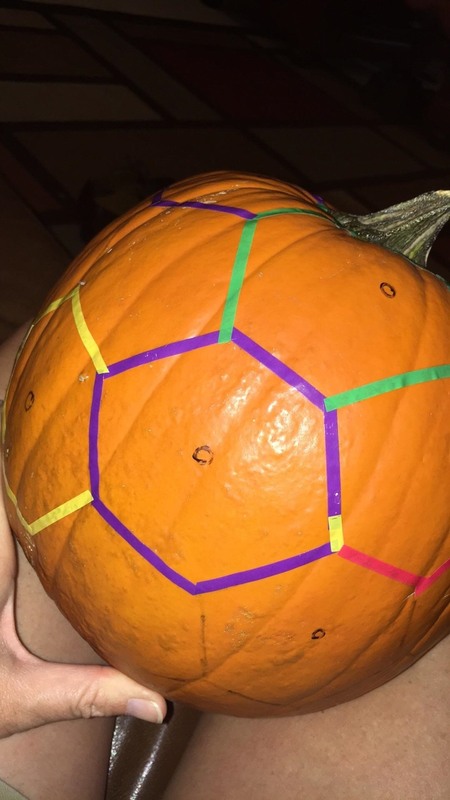 I would love to see someone carve the truncated icosahedron using the same method of cutting out all of the faces instead of just the pentagons. I'd also love to see some other polyhedra. I think the cubeoctahedron and rhombicubeoctahedron would look great, and it wouldn't be too hard to figure out where the vertices were. 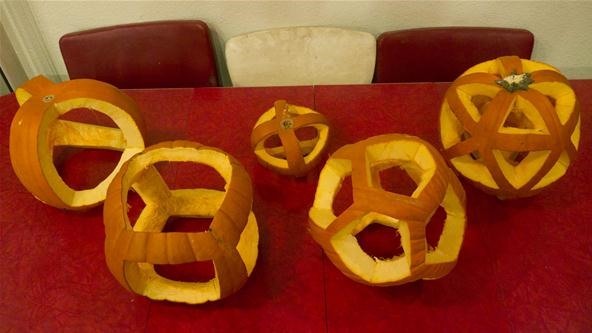 If I get a pumpkin I think I might try the icosahedron, but I want to wait and see what the fractal designs look like! 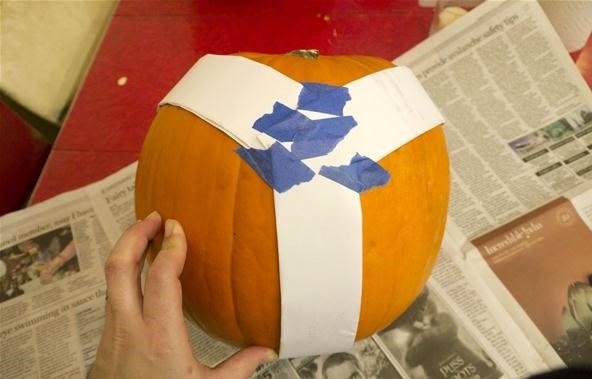 Carve two pumpkins! But if you can only do one then I guess it's only fair I tell you a bit about Thursday's post. I was going to do the sierpinski triangle, the sierpinski carpet, and the koch curve for the fractals and there will be some star patterns in addition. Math and geometry have never been so Awesome :D !! Very interesting! How this mathematics is all them forms. I made one. 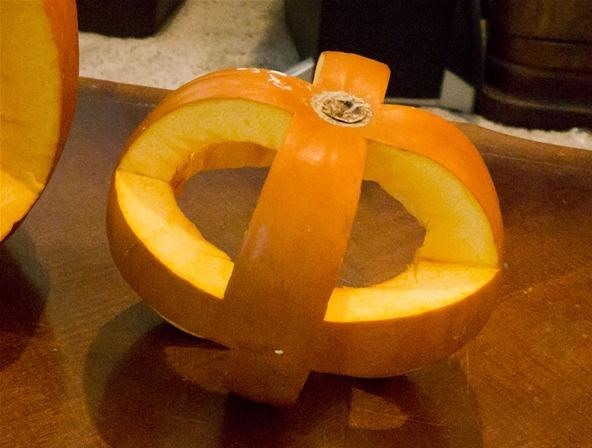 It's not perfect but the pumpkin wasn't perfect. 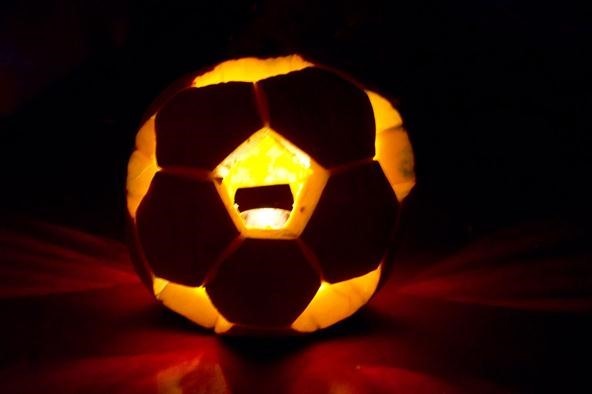 It's good enough to please the Chelsea FC fan in the house. I couldn't have done it without your tutorial. scrapbook stickers I found at Hobby Lobby. 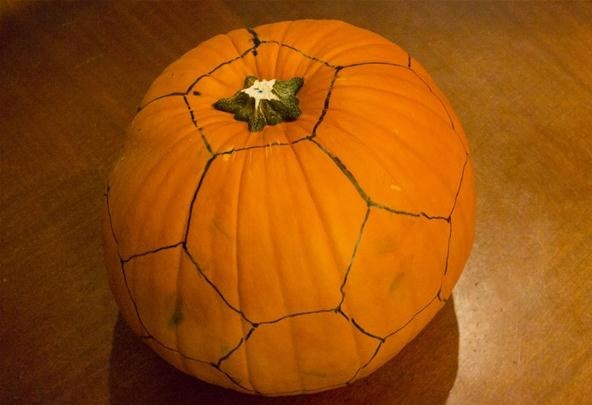 Then only shaved the skin inside the hexagons.